SMUpreneurs is an affinity alumni group of the Singapore Management University Office of Alumni Relations and under the auspice of the SMU Alumni Association. We are here to support fellow alumni entrepreneurs be it Startups, Small Medium Enterprises or Family Businesses. As part of our community effort, we hold at least 1 networking event every quarter to foster greater community ties. 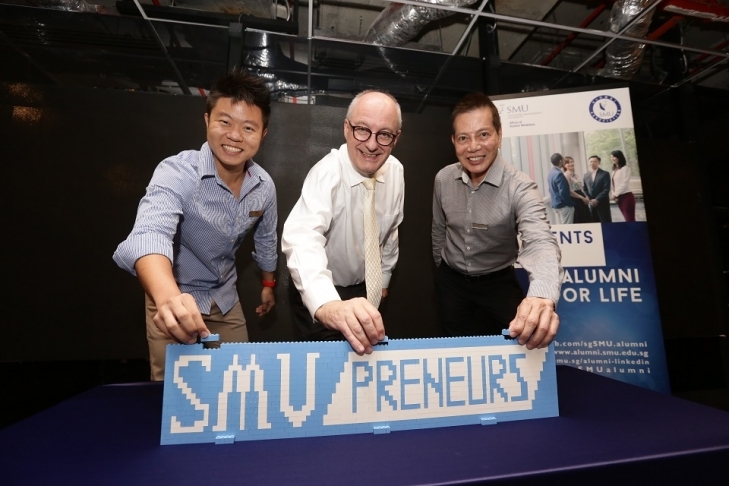 Walt Disney once famously said, “If you can dream it, you can do it.” This has to be one of the shared sentiments amongst our alumni entrepreneurs at the launch of the SMUpreneurs – SMU’s Entrepreneurs Alumni Group. Ideas were floating around, business connections were made and everyone was passionately discussing dreams, ideas, and potential collaborations. SMUpreneurs President Ivan Chang (BBM, Class of 2014) said, “Six months ago, when the idea to resurrect the SMU Alumni Entrepreneurship Group was floated around, I was still thinking we would be lucky to see 50 people show up for our event.” About 120 alumni turned up for the launch at YDM Global Office including Guest-of-Honour SMU President Professor Arnoud De Meyer. “Words cannot express how grateful I am especially when I see how our community of entrepreneurs actively came forward to work together towards this shared vision of ‘For Entrepreneurs, By Entrepreneurs’; so I shan't but just say my thanks to each and every one of you. “ Ivan continued in his Thank-You email following the launch. Professor Arnoud took the stage and expressed his soft spot for entrepreneurship, “It is always a pleasure coming to an alumni event and there is a special corner in my heart when it comes to entrepreneurship.” As an entrepreneur himself, Prof Arnoud shared his experience with the alumni and he hopes that many of them would come back to SMU as alumni mentors to students who are aspiring to be entrepreneurs. SMU’s Office of Alumni Relations (OAR) Associate Professor Low Aik Meng then introduced the members of the Executive Committee (Exco) behind SMUpreneurs under the leadership of Ivan. “For SMU to be great, we need a strong group of alumni. We need our alumni to keep coming back to give to the University. We want provide a platform for all SMU alumni entrepreneurs to come together to make SMU proud” he said. “I volunteered to serve in the Exco because I want to do something for SMU alumni. All of us have different areas of expertise and we complement each other’s strengths” shared Exco Member for Marketing and Outreach Stephanie Wu(BBM, Class of 2012). And the Exco worked hard to lay out the plans ahead for the Group which Ivan shared during his presentation. The Road Map 2016/2017 was shown with two key projects that SMUpreneurs would embark on; the SMUpreneurs Directory and a joint study mission trip to Silicon Valley. There will also be four networking events yearly for SMUpreneurs which is made up of undergraduate and postgraduate alumni. Guided by a couple of principles unique to SMUpreneurs for these events; the Group aims to source from SMU alumni owned or operated businesses first, to push automation and use of digital platform for even greater pre-event value and to actively welcome any SMU students, faculty and staff who are entrepreneurs or would-be entrepreneurs as well. The highlight of the evening was the official launch of the Group with the SMUpreneurs logo made up of 1000 Lego bricks, painstakingly put together by Ivan. The last three Lego bricks to complete the logo were put together by Prof Arnoud, A/Prof Low and Ivan. The symbolism of the Lego model represents how entrepreneurship is about connecting and joining different elements together, and when things don’t work out, to have the courage to disconnect and reconnect. And this is what dreams are made of. Click here for more photos from the event. Visit http://www.smupreneurs.com/ for more information and updates on SMUpreneurs.